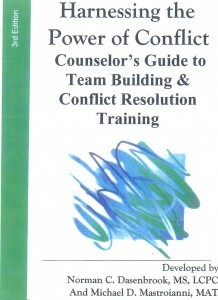 Counselor’s Guide to Team Building and Conflict Resolution Training: Videos, Book and support materials. “Apply Counseling Skills to Corporate America”. Training corporate America can be another “income stream” for your private practice. Being a corporate trainer or consultant is not as difficult as you may think. As I emphasize in my private practice seminars, mental health professionals have the skill set necessary to compete with other organizational development consultants and trainers. Helping work groups improve communication and enhance relationships takes the same skills as helping families. 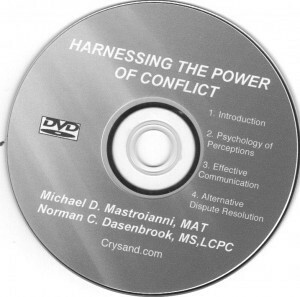 I have been working in this field along with my partner Michael Mastroianni, MAT for the past 20 years. Over those years Michael and I have developed a corporate consulting and training package based on our motto, “The quality of the product or service that corporate America delivers is directly dependent on the quality of the working relationships. And the quality of working relationships is directly dependent on how well employees and management communicate. 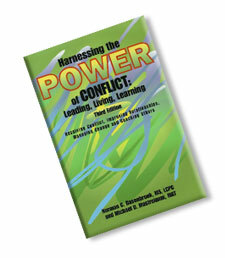 The package also contains our DVD, “Harnessing the Power of Conflict,” which presents a corporate training session. Participants Manual: Hand-out material and interactive (experiential) group exercises. PowerPoint presentation based on the DVD. Don’t try to re-invent the wheel. This package includes everything you need to provide a full day of corporate training. Using this package you can charge $600.00 – $1,200.00 per day. The components can be used for many 1-2 hour presentations or be employed as a whole to help facilitate corporate change. Want to stay up to date with the latest private practice information? How about staying up to date for free? No dues or membership fees required! Enter your email address to the right and we will add you to our list. When we have late breaking news, new questions and answers, add web content, blog, schedule workshops or upload a video to YouTube you will receive the newsletter.